Leftist MK threatened with arrest, interrogation, if she lands in Belgium. 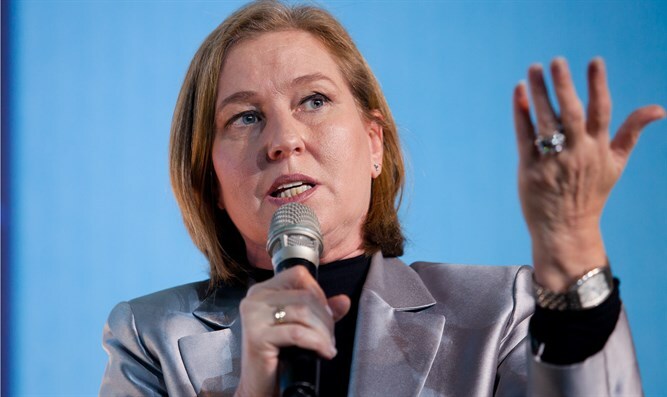 MK Tzipi Livni (Zionist Union) will be detained and questioned in connection with war crimes charges if she lands in Brussels, a Belgian Justice Ministry official said ahead of the Israeli politician’s planned visit there. On Thursday, Belgium’s Le Soir daily quoted a federal prosecutor as confirming authorities intention to detain Livni, a centrist lawmaker, as per a complaint filed against her by a local pro-Palestinian group in connection with Israel’s 2009 assault on Hamas in Gaza when Livni was foreign minister. Thierry Wertz, a spokesperson for the Brussels prosecutor's office, told Le Soir that Livni is the subject of a 2010 complaint and that justice authorities "may use her arrival to try and advance the investigation." Livni was due in Brussels on Monday to attend a conference organized by the European Jewish Association on the security of Jewish communities and anti-Semitism, as well as a discussion at the European Parliament on countering attempts to boycott and isolate Israel. Pro-Palestinian entities have repeatedly filed charges against Israeli officials, including former prime ministers Ehud Olmert and Ariel Sharon, in European countries. In some cases, such as in Britain, authorities prevented Israelis from being detained by executive order. In others, they warned Israelis subject to a detention order, which would be seen as a diplomatic embarrassment to Israel and its allies, not to touch down. On Friday, Israel condemned Belgium for planning to interrogate Livni for war crimes.